A recent submission by KaD came in containing two Maul Talk terms: “These are really nice dogs if you’d just give them a chance.” We separated the terms into: “really nice dogs” and “give them a chance.” Tackling the latter term first, Google Search results show that the query (“pit bull” and “give them a chance”) has over one million results. This term often centers around the obscene number of unwanted pit bulls — about a million annually — that arrive in open admission shelters of which 800,000+ are euthanized. The plea, give them a chance, is echoed gratuitously despite the breed’s unmatched, killing record. After the horrific dog mauling death of 21-month old Monica Laminack by her family’s seven pit bulls, relatives told investigators that the toddler often played with the dogs and would “use them as pillows” while watching TV. Google Search results show that Laminack’s relatives are not unique. The term, “use them as pillows,” yet another disturbing pit bull myth rife with dangerous propaganda, is spread across the Internet by numerous Nutters (See related myth: Nanny dog). Authorities anticipate charges against the adults who were home “napping” while the seven pit bulls tore little Monica apart. After publishing this post, a user sent in the below information to show that pillows aren’t always innocent fluffy objects used to lay your head upon. Pillows, however, do not kill people spontaneously, without specific direction from those who use them. Daily World, The (Aberdeen, WA) – March 27, 2013 — Man says he ‘committed a father’s worst sin,’ pleads not guilty to shooting — Michael League called 911 early Sunday to report he’d “committed a father’s worst sin,” authorities said.League, 69, told police he took his .22-caliber Ruger pistol and shot his adult son and daughter in the head as they slept in his Puyallup home, court records show.He allegedly used a pillow to muffle the sound of the gunshots so as not to wake his wife and two young grandsons, who also were asleep in the house. Clear Creek Courant (Idaho Springs, CO) – December 5, 2012 — Investigator: Elmgreen confessed to killing father, Judge finds probable cause at preliminary hearing — During a preliminary hearing in Jefferson County Court on Nov. 30, a homicide investigator testified that defendant Kenneth Elmgreen admitted to killing his elderly father and then attempting suicide.Evergreen resident Elmgreen, 53, was arrested in early August on charges of first-degree murder, attempted first-degree arson and two counts of crimes of violence.Last Friday, Jeffco sheriff’s Investigator Kathleen Battan testified that Elmgreen said he used a pillow. Bismarck Tribune, The (ND) – October 3, 2012 — ND murder suspect scheduled to change plea — DICKINSON (AP) – Trial has been canceled and a change-of-plea hearing scheduled for a North Dakota man accused of killing the mother of a child he believed was his daughter.Dirk Huber of Belfield had pleaded not guilty to murdering Nicole Radebaugh in her apartment bedroom in August 2011. He was scheduled for trial beginning Oct. 15. Court documents show that he will appear in court to change his plea instead.Authorities allege that Huber used a pillow to suffocate Radebaugh. San Francisco Chronicle (CA) – July 20, 2012 — Woman charged with murder – Bible possibly a weapon — A woman smothered a romantic rival with a pillow and beat her – possibly with a Bible – while chanting religious passages as part of what she called an exorcism, a prosecutor said Thursday. Karla Kuhl, 35, of El Sobrante has been charged with murdering 58-year-old Patricia Medeiros, said Contra Costa County prosecutor Harold Jewett.Sheriff’s deputies responding to an early morning medical call on June 5 found Medeiros dead in her home. Herald-Dispatch, The (Huntington, WV) – February 8, 2012 — Man accused of trying to kill daughter, Father allegedly used pillow in an attempt to suffocate girl, 11 months old — HUNTINGTON — A local man found himself behind bars Tuesday, charged with trying to kill his infant daughter.Authorities charged Larry James Thomas, 40, with felony attempted first-degree murder, along with misdemeanor domestic battery and carrying a concealed weapon without a license. Criminal complaints describe Thomas as a convicted felon wanted out of Boyd County, Ky.The incident with Thomas’ 11-month-old daughter happened just after 11 p.m. Monday. Dickinson Press (ND) – November 8, 2011 — Officer: Pillow used to suffocate Radebaugh; Huber pleads not guilty to Belfield homicide — Nov. 08–Dirk J. Huber is believed to have used a pillow to kill his former girlfriend after allegedly arguing over the paternity of her daughter, officials said during his pretrial conference in Dickinson on Monday. The 41-year-old pleaded not guilty Monday to murdering Nicole Lynn Radebaugh, 39, by suffocating her in her Belfield apartment in August. A veteran British TV reporter has been sentenced after he admitted making up claims he killed a former lover who was dying of AIDS. A judge gave BBC journalist Ray Gosling a 90-day suspended prison sentence for fabricating his confession and wasting 1,800 hours of police time.The 70-year-old Gosling drew media and police attention in February when he said on a BBC TV documentary that he used a pillow to smother his dying lover in his hospital bed. Grand Rapids Press, The (MI) – January 13, 2009 — Life sentence ‘what I deserve’ — GRAND RAPIDS — Against the advice of his lawyer, 41-year-old Andrew Neal pleaded guilty Monday and accepted a lifetime in prison for murdering a woman he called his close friend. “It’s what I deserve, your honor. There is no excuse,” Neal told Kent County Circuit Judge Paul Sullivan after admitting he used a pillow to suffocate Mashonda Griffin, 35, in her Wyoming home, at 2940 Union Ave. SE, on Oct. 27. After the catastrophic pit bull mauling of Linda Henry, 54, of Westwego, Louisiana, her boyfriend Clarence Allen said, “I don’t know why they did it … They never had a fight. I don’t understand it.” Three of the couple’s four adult pit bulls ambushed Henry after she walked into her home. The woman lost an eye, ear and both arms to amputation in the horrific assault. The pit bulls also ripped off the entire back portion of her scalp. The response by pit bull owners, “I don’t understand it” is complete denial of well documented pit bull attack traits revealed over and over again in serious and fatal pit bull maulings. After a pet pit bull violently attacked Ryan Maxwell killing him, the owner of the dog, Ashiya Ferguson, emphatically declared: “Oh God, it was so horrible. I couldn’t stop it. I couldn’t stop it. I couldn’t stop it.” Ferguson is hardly alone in the inability to stop a tenacious pit bull attack, which is Part One of why many communities regulate this dog breed. Part Two is the damage this breed inflicts during its assault. In the case of Ryan Maxwell, the dog clamped onto the boy’s throat and refused to release. The dog was still clamped on when police arrived. As usual, to “disengage” the pit bull, officers had to shoot the dog. This term is often used by persons who witness or experience a violent, unpredictable pit bull attack. Unfortunately, there are decades of documented evidence about the dangerous unpredictability of pit bulls (fighting dogs). Part of the unpredictability of an attack by a pit bull is that the breed often fails to show warning signals, such as a growl, bark or direct stare prior to its attack. 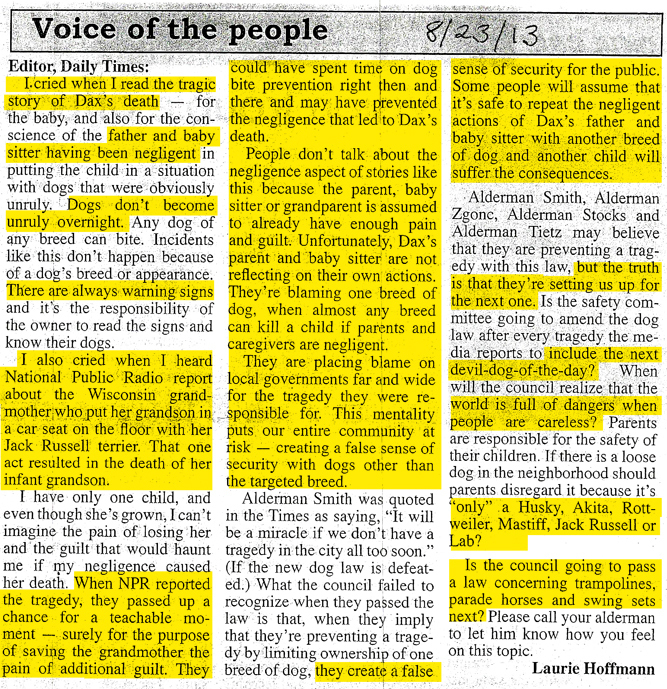 Pit Nutters like to “educate” readers that “pit bulls never snap.” There are always warning signals they claim — AKA blame the dog owner or the victim. This statement is often made by Maul Talkers after a horrible pit bull attack. It is used to deny the pit bull’s responsibility and the breed’s genetic history by shifting the blame onto the dog’s owner. The term is also used to victimize pit bulls. What goes notably unmentioned by Maul Talkers are the many disfiguring and deadly pit bull attacks that involve “loving household” pit bulls that were never trained to attack prior to the dog’s berserking incident.